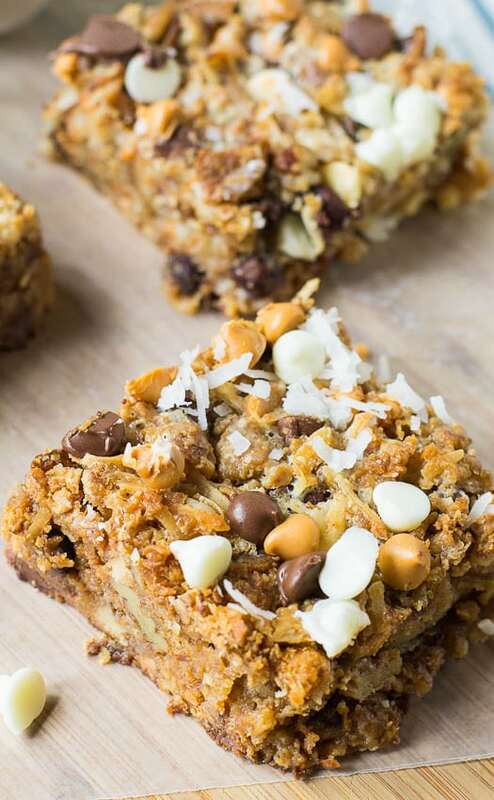 Hello Dolly Bars are a wonderful blend of graham cracker crumbs, butter, chocolate and butterscotch chips, coconut, nuts, and sweetened condensed milk. It’s the sweetened condensed milk that makes me swoon over these bars. It’s pretty much the nectar of the gods. There was a half a can leftover from this recipe and I was tempted to drink it y’all. 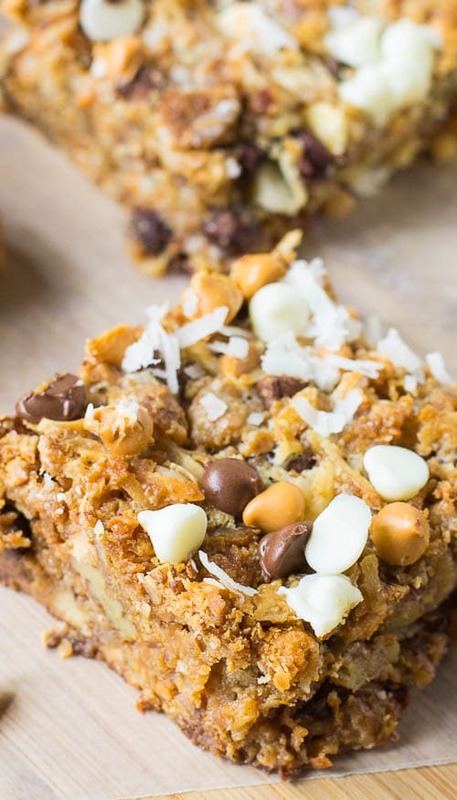 Hello Dolly Bars date back to the 1960s when Hello Dolly was on Broadway. This is a bar with a multitude of names and they’re also referred to as 7-Layer Bars and Magic Bars. No matter what you call them, they are undeniably delicious. They’re dense, gooey, sweet, and super indulgent. They are breeze to make, but they do need to be made a day ahead to allow them to set up before you cut them. You’ll have to practice a lot of self-restraint to not dig in right away. 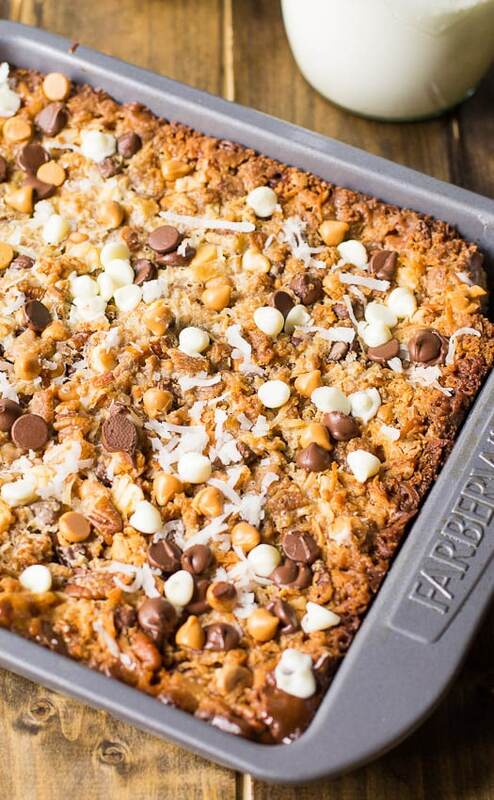 This is a recipe I’ve adapted from More From Magnolia and it’s a little different from most Hello Dolly Bars. Instead of having a separate graham cracker layer on the bottom, the graham crackers crumbs are mixed in with the other ingredients. I think I like this method better. When you initially take them out of the oven, they’ll look like a gooey, oily, liquidy mess. But they start to set up almost immediately. 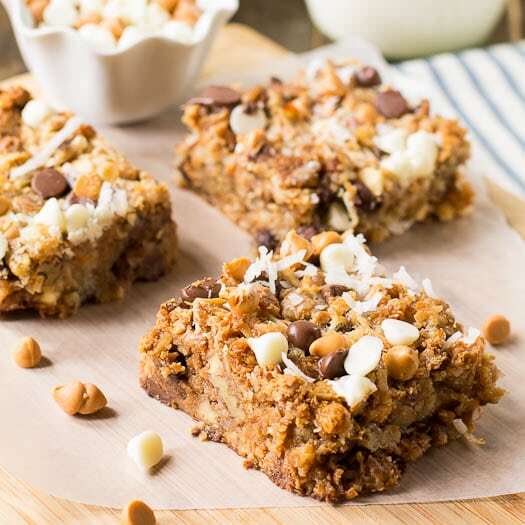 This retro dessert bar is a sweet and indulgent mix of graham cracker crumbs, butter, chocolate and butterscotch chips, coconut, pecans, and sweetened condensed milk. Preheat oven to 325 degrees and lightly grease a 9-inch square baking pan. In a large bowl, mix together all ingredients except sweetened condensed milk. Transfer mixture to prepared pan and pat down evenly. Slowly pour sweetened condensed milk over the top. Bake 30-35 minutes, or until light golden brown. Cool completely and then cover in plastic wrap. Let sit at room temperature overnight before cutting. This entry was posted in Brownies and Bars and tagged butterscotch, chocolate, coconut, pecans. Bookmark the permalink. Would you list amounts for a 9×13 pan, or could you just double listed amounts? The original recipe in More From Magnolia Cookbook actually uses these same proportions in a 9X13-inch pan. You will just get a thinner bar. They say the cooking time is 30-35 minutes, but I found mine (which I expected to take longer) done at about 30 minutes. It will be gooey and kind of liquidy when you take it out of the oven so to judge when it’s done you’re looking for it to turn kind of a golden brown. If you cook in a 9X13-inch I would definitely give it a check at no later then 25 minutes. If you want a thicker bar in a 9X13-inch pan, I would think the recipe would still turn out fine if you increased each ingredient by 25%. It really is so good isn’t it? I grew up eating these — my mom made them all the time. It’s been far too long since I’ve made them, and I need to try this method with the graham crumbs mixed in. These look delicious, Christin! Oh dear – these sound incredible – condensed milk is da bomb! When i lived in Abu Dhabi, there was a little restaurant that made the best tea with condensed milk – so creamy and delicious! 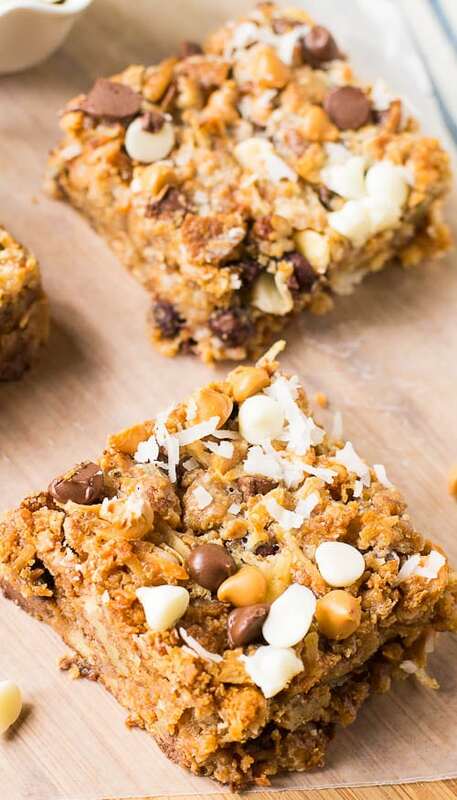 These bars seem like the perfect combination of ingredients! Love the addition of butterscotch and graham crackers in here, too! Wow what an amazing bar! Never heard of these before but by the looks of them, I think I must have been missing out! Will have to try! 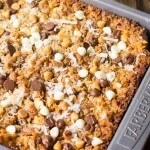 My family always called them Magic Bars, but never had butterscotch in them. My mom always makes them at Christmas. These look heavenly. You can’t go wrong with so many good things packed into one bar! Thank you Medeja! Hope you are having a relaxing weekend!